Exclamation Mark is just not like anyone else. 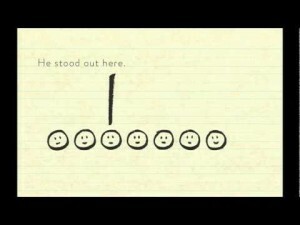 As much as he’d like to look the same, he’s always a standout in a crowd. He was confused, flummoxed, and deflated. He even thought about running away.. Clever wordplay and fun, expressive illustrations will captivate children old enough to understand punctuation and the important role it plays in our language. Older readers will enjoy the double entendre and will celebrate Exclamation Mark’s voyage of self discovery. Why oh why is he different? He wants nothing more than to look just like the periods around him. It is only when Question Mark arrives on the scene that Exclamation Mark discovers something deep within – he discovers why and how he has an important role to play – despite his rather unique upright appearance. An outstanding 2013 picture book, Exclamation Mark is highly recommended for readers aged five years and up. Exclamation Mark has been nominated for a 2013 Children’s and Young Adult Bloggers’ Literary Award. Lion decides that Sarah would make a tasty lunch especially since she can’t stalk like Tiger or leap like Gazelle. Sarah suggests that she can do something that no jungle creature can do. She can draw. When, at last, she shows Lion her picture, he is not impressed with the angry lion face he sees and, when the other animals agree that he is a bully, Lion decides to change his ways. Wonderful descriptive language and bright, bold drawn and computer-generated illustrations enhance this examination of bullying behavior and leave readers with a sense of optimism about one’s ability to speak up, enlist help and ultimately encourage a bully to change for the better. Lion’s Lunch is best suited to children aged four and up. 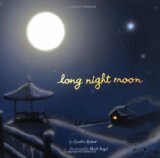 Simply told and beautifully illustrated, Long Night Moon encourages us to carefully consider the beauty of the moon when it is full and how the world around it changes during a calendar year. Did you know, ‘In June the Strawberry Moon shimmers on succulent buds, on crisp new shoots, on quiet, grateful rabbits’? Both evocative and magical, once read, the full moon will never seem quite the same. A lovely bedtime story, it would be great to connect this picture book with a nighttime walk out of doors. Recommended for children aged 3 – 6. Note: for older children, Rylant’s use of personification could be examined.